George McCool is Kevin's great-great-great-grandfather. Although our family records show that George was the son of a George McCool, it appears that that is not the case. We now believe he was the son of Joseph McCool (perhaps Joseph George McCool?) and Sarah Walker. This is loosely supported by the paper trail and strongly supported by many DNA tests. 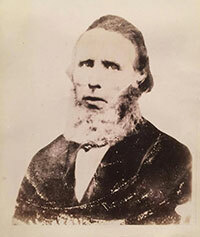 George McCool, was born December 25, 1805 in Ontario, Canada and lived for some years on his father's farm near the little city of Brandford [Brantford]. George married Maria Hazelton in 1831, and they had one son, Henry McCool. Maria, born circa 1807, died in 1835. About three years after Maria's death, George married again - to Elizabeth Swain. At this farm home, five of their ten children were born. In 1847, the family moved to a home of their own in Yarmouth Township - "a beautiful country not far from Lake Erie." Three years later, they moved to Hibbart Township, a heavily timbered country north west of London and Seaforth, where "cheaper land could be obtained for the boys". In March, 1856 they again moved, this time leaving Canada for a "new home in the states", locating on a rented farm near Decatur, Illinois. The next spring grandfather [George] bought a prairie farm near Macon, Illinois adjoining one on which Uncle Henry [McCool] lived. Selling and moving again, he bought the "Jack Hight place", south of Macon, which he later sold to Grandfather Ireland [Robert Jr]. Early in 1863, they returned to Canada, renting a place not far from their former home, where they remained about two years. Returning to Macon County, they bought from Ed Gray, a farm adjoining one owned and occupied by Uncle Will and Aunt Mollie McCool Hight. Here grandfather died on December 9, 1866. Grandfather was buried at Long Grove Cemetery, south east of Macon, Illinois. It was here grandmother [Elizabeth Swain] lived with her daughter Samantha (Aunt Mott), then a widow, until the latter's marriage to George Culbertson. The house on this place, years later, was used by Frank McCool as an implement shed - the farm having been sold by the other heirs to Frank's father, Uncle William Henry McCool. Maria Hazleton McCool is buried in the Boston Cemetery, near Simcoe, Norfolk County, Ontario. Her "Find-a-Grave" record reports that she died on 1 Jun 1835 at age 21, making her birth year about 1814. Others report that she was born about 1807. George died on 9 Dec 1866. He's buried in the Long Grove Cemetery in Decatur, Macon County, Illinois. During the last years of Elizabeth's life, she made her home with her daughter, Samantha Culbertson (Aunt Mott). At the time of her death, Dec 26, 1891, she was visiting another daughter, Catherine Culver (Aunt Priss) in Springfield, Illinois. She is buried at Long Grove Cemetery beside her husband George.